A Day of Reciprocity. —. 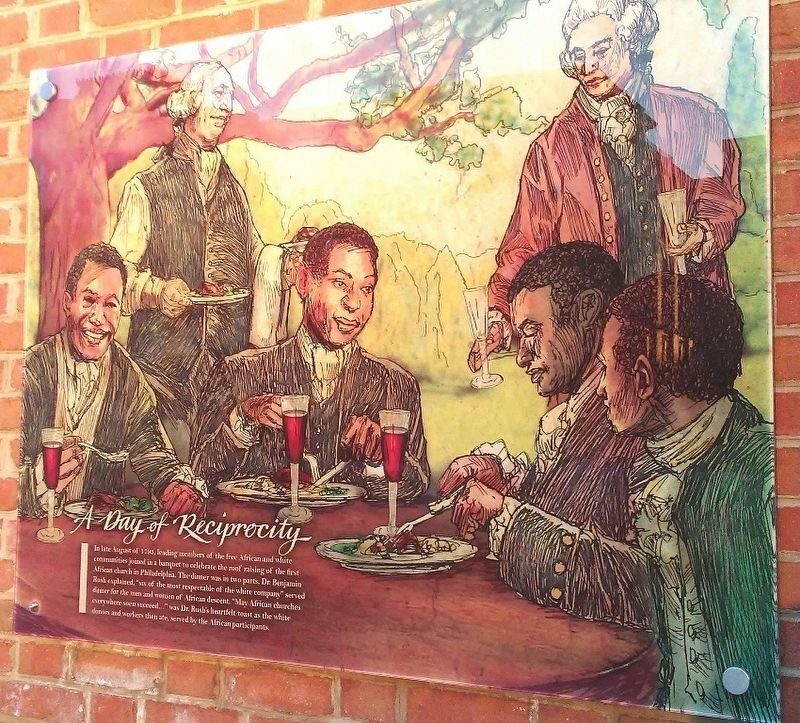 In late August of 1793, leading members of the free African and white communities joined in a banquet to celebrate the roof raising of the first African church in Philadelphia. 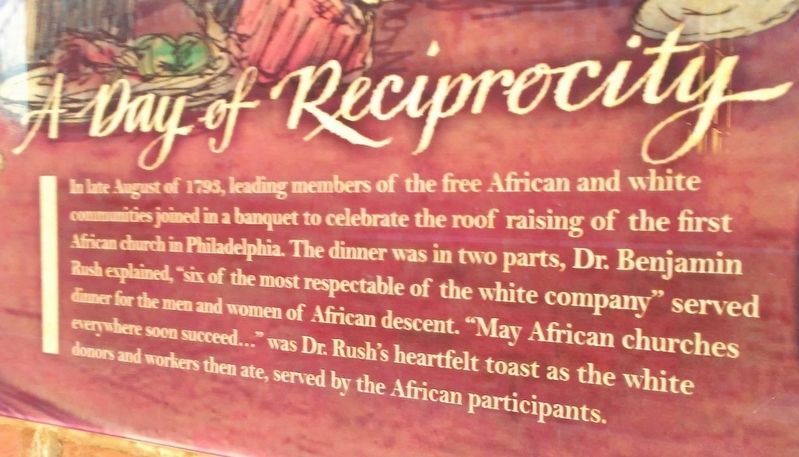 The dinner was in two parts, Dr. Benjamin Rush explained, "six of the most respectable of the white company" served dinner for the men and women of African descent. "May African churches everywhere soon succeed..." was Dr. Rush's heartfelt toast as the white donors and workers then ate, served by the African participants. Location. 39° 57.031′ N, 75° 9′ W. Marker is in Philadelphia, Pennsylvania, in Philadelphia County. Marker is at the intersection of Market Street and South Independence Mall West (6th Street), on the left when traveling west on Market Street. Touch for map. Marker is at or near this postal address: President's House Site N of Liberty Bell Pavilion, Philadelphia PA 19106, United States of America. Touch for directions. (here, next to this marker); "Burn this treaty to Hell!" (here, next to this marker); "I am free now" (here, next to this marker); "We shall come to a civil war" (here, next to this marker); Death Carts (here, next to this marker); Promoting the Abolition of Slavery (here, next to this marker). Touch for a list and map of all markers in Philadelphia. More. Search the internet for A Day of Reciprocity. Credits. This page was last revised on March 26, 2017. This page originally submitted on March 26, 2017, by William Fischer, Jr. of Scranton, Pennsylvania. This page has been viewed 128 times since then and 17 times this year. 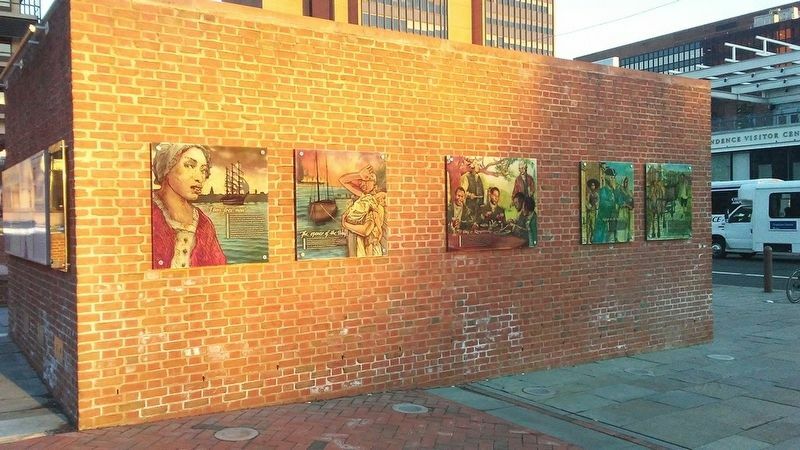 Photos: 1, 2, 3. submitted on March 26, 2017, by William Fischer, Jr. of Scranton, Pennsylvania.